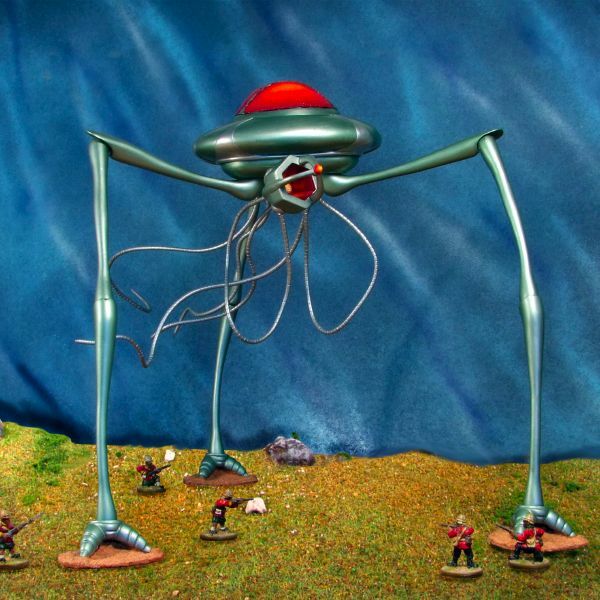 Eureka Miniatures has released a massive (400mm or so tall) tripod fighting machine suitable for Martian invasions of Earth and other such games. There’s also a Martian cephalopod to go with it. The tripod works out at £82.50 including VAT. That’s a substantial sum for most gamers, so Fighting 15s will not be holding stocks of either it or the cephalopod. However, the items are listed in the online shop (codes 100SCI01 and 100SCI02) and can be obtained to special order with an estimated delivery time of about eight weeks (they will be added to our bulk shipments which only get dispatched on reaching 30kg; working this way cuts about 7% off delivery costs and, perhaps unbelievably, keeps prices lower). Anyone who absolutely must have a tripod fighting machine quickly should go direct to Eureka in Australia. It will almost certainly attract VAT and a tax collection fee on arrival in the UK: you have been warned.